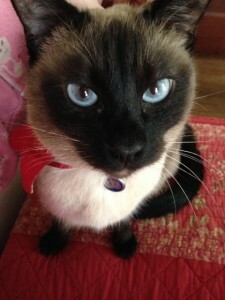 Home Case Studies Indigo S.
First Entry – May 3, 2015: Indigo was diagnosed with feline hyperesthesia (rippling skin disease) in July 2010, after hallucinations, seizures and vomiting began when I switched him off of kitten chow. Red dye in food was definitely triggering the hyperesthesia episodes. There is no real treatment for hyperesthesia other than to try and avoid the triggers. I give him valerian root when he is having an episode and it seems to help. Indigo was diagnosed with eosinophilic enterocolitis in September of 2014 through a surgical biopsy. He had started vomiting daily and had developed bloody diarrhea that became pretty much daily and outside of his litterbox. Initially he was treated with two week antibiotics and10mg/ml prednisolone .50mls twice daily. He was also de-wormed as a precaution. During this time, we also did food trials. Indigo refuses to eat wet food, which has made the process more difficult. Currently he eats Blue Buffalo Wilderness rabbit, he’s been pretty stable on this. His predisone was eventually dropped to .25 ml once a day and then every other day. In December he had a flare up with daily bouts of diarrhea. We administered an injectible long lasting antibiotic (weeks) and I started him on probiotics (Fortiflora 1 package daily) and the diarrhea has stopped. Within the last month or so, Indigo stared vomiting again around once a week or so. Then it started to increase a bit. Vet put him back on prednisolone daily and his diarrhea immediately came back. So we reduced the pred and the diarrhea stopped, but vomiting continued. Vet wants to get a baseline for “normal” on Indigo and for now we have stopped the pred completely, but I have added digestive enzymes (Dancing Paws) to his food along with the probiotics. I am tracking his upsets and I have to keep in touch with the vet. If there is no significant flare, the vet would like to try and go a month off of the pred to see if that is contributing to his problem. Indigo is eating VERY well and even appears to have gained weight! Still no diarrhea, but vomiting continues sporadically. October 27, 2015: Indigo has been doing fairly well. At the end of the summer, and at the vets urging, we started Indigo on Prozac. His history seems to indicate that stress definitely plays a very big role in his flares. He started out at .25 ml a day, and we have gradually increased him to .4 ml per day. The change has been unbelievable! Our once extremely nervous cat has become much calmer & has been more affectionate and talkative! The best part, knock wood, he hasn’t had any flares in months. So currently he gets .25ml of prednisolone and .4 ml of Prozac daily and we are keeping our fingers crossed. He is still eating Blue Buffalo Wilderness rabbit & he continues to get his FortiFlora. I know these results are not typical, but again, Indigo has a rare form of IBD, and so he has different triggers & requires some out of the box thinking. April 1, 2016: Indigo had been doing very well. In August we had decided to start giving him Prozac. He had been abused as a very young kitten, & has always been very nervous. We were starting to notice that when anything happened around him that stressed him in the least, he would start to flare. 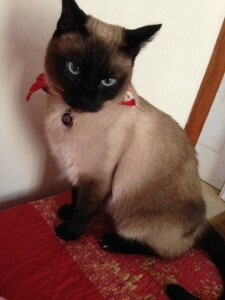 Once we began the Prozac & he had been on it for a bit & we had adjusted the dosage, Indigo turned into a different cat! Much more affectionate, asking for attention, more vocal…he seemed so much happier. And we hadn’t had any IBD episodes for quite some time. Within the last couple of weeks, I noticed that his personality started regressing. He didn’t want to be touched, was hiding more & so I started keeping an even closer eye on him. Last week I watched him in the litter box. He was squirming around & shifting positions & clearly having a hard time. Once he got out, I saw an enormous stool with blood on it. I immediately called the vet. The fear right now is that the IBD is causing damage & that he is developing megacolon. The vet is reluctant to put him on a stool softener, because in the not so distant past he has had horrible diarrhea. For now, he wants me to monitor his litter box habits closely, & if the blood & large, rock hard stool continues, we will be starting him on metamucil or something like that. The vet also explained to me how to palpate his stomach to check for constipation & possible stool blockages, as he also wants to make sure that he doesn’t become so blocked that surgery is required. Fingers crossed that everything works out ok.
August 14, 2017: He is currently off all meds and is being managed with just food. Occasionally he will start vomiting again, but a lot of that seems to revolve around weather, with the hot humid days seeing an increase in upset stomach. New vet said that his IBD is related to food sensitivities and is surprised that the limited ingredient foods didn’t work for him. Also amazed that Blue Buffalo Wilderness Rabbit seems to be the only one that actually does. So we just go with what works! November 12, 2018: Indig had to change to a hydrolyzed diet which he did not do well on at all! Indigo finally got so sick, we slowly switched back to the old food, keeping the sick kitten we have off of wet food. We think that’s what was giving him issues, as we had rescued 2 new kittens in May, and he was getting a lot more wet food to try to keep him out of the kittens food. But as soon as we put Indigo back on his Blue Buffalo Wilderness rabbit, he cleared up in about 2 days. Fingers crossed on our other cat. We are watching him closely. What we have learned over the past year is that as long as he stays on Blue Buffalo Wilderness Rabbit, he is fine. Change it to a hypoallergenic hydrolyzed diet, which he should have been fine on, and all hell breaks loose.